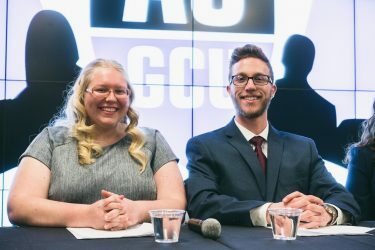 New initiatives and how to execute them, along with diversity, were the major topics Monday night as students, staff and faculty gathered at GCBC on the second floor of the Student Union for a debate between the three groups running for student body president and vice president. 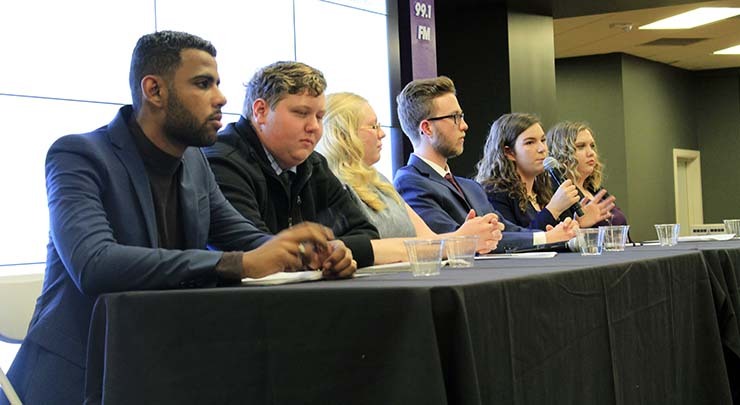 Hosted by the Associated Students of Grand Canyon University (ASGCU) and moderated by ASGCU program coordinator Brittney Calton, the debate began with opening statements as the candidates introduced themselves and highlighted their key platform points. 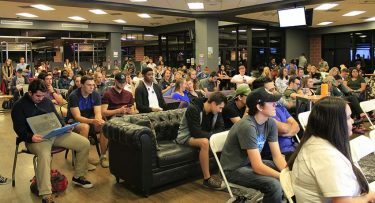 Students, staff and faculty gather on the second floor of the Student Union on Monday night to witness the ASGCU debate. 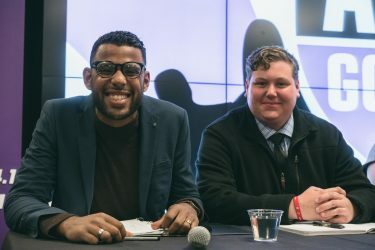 Noah Wolfe and Stephen Steininger summed up their platform by stating that “everyone on campus is valuable and an asset to the major puzzle that GCU is.” Wolfe and Steininger also pointed out that they want the campus to “continue becoming and believing in students succeeding at their passions,” while developing communication, providing commuters with opportunities and getting students more involved on campus. Megan Kronstedt and Joshua Walker used the opening statement to explain their plan to unite the campus through Christ’s love. Additionally, Kronstedt talked about how her time in the GCU freshman class council and ASGCU senate and her role as a children’s pastor have taught her about the power of building relationships and being intentional with people. 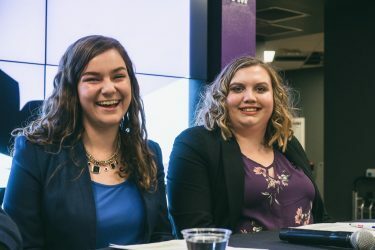 Catherine Toews and Brittany Summers pointed out that they wanted students to feel so connected that years from now they would still call GCU “home.” Toews explained their focus on community, tradition and beautification. She said they wanted to embrace diversity by celebrating different holidays, including Chinese New Year and Holi. With the slogan “Stand Together,” Toews said they believed everyone should feel equally welcomed at and bonded to GCU. All of the candidates expressed their love for the University and the need to create an inclusive atmosphere. “Cat and I just want to embrace everyone and feel God’s presence on our campus,” Summers said. Steininger suggested having a student-involvement survey that would use the information to shape campus activities. Wolfe spoke to the idea of a leadership certificate program to acknowledge student leaders on campus. “We have a phenomenal student body on campus, and we want to recognize their accomplishments as student leaders, track their progress and then give them a certificate when they graduate,” he said. Krondstedt highlighted the “Shine a Light” initiative. She said it derived from Matthew 5:16. Another significant topic was diversity on GCU’s campus. She talked about building connections with existing diversity and multicultural clubs on campus and providing student leaders with training over the summer on the topics of diversity. Toews talked about the importance of having diversity. “It’s such a great thing to have and to explore, and we want to create those conversations through different avenues,” she said. Candidates also were asked about their methods for executing their platforms. Toews said that, in their two years in ASGCU, she and Summers have had the opportunity to see a lot of different ideas. “We would like to highlight transparency in our administration because we know that sometimes ideas take longer than we would like and sometimes there are hiccups along the road,” she said. The ASGCU elections close at 7 p.m. on Wednesday, January 31. Kronstedt is passionate about ministry, creative arts, government and serving others. Walker is passionate about business, finance and technology. Toews is passionate about travel, hiking, exploring, friendships and continually bettering herself and the environment around her. Summers has a passion for serving the student body and the Lord. She has been on the ASGCU Senate for the past two years. She believes also believes it is important to see the world and has been to Japan, England, Scotland, Ireland, Spain, France and Italy. Wolfe is passionate about reading, traveling and drinking Stampedes. Steininger is passionate about ultimate Frisbee and eating breakfast foods.